And why not. As the interface between state and private criminality, following the money trail is oxygen and combustible fuel for rooting out corruption in high places: indelible signs left behind like toxic tracks by our sociopathic masters. After all, there’s nothing quite like exposing an exchange of cold, hard cash from one greedy fist to another to focus one’s attention on the business at hand. And when that dirty business is the subversion of the American people’s right to privacy, there’s also nothing quite like economic self-interest for ensuring that a cone of silence descends over matters best left to the experts; a veritable army of specialists squeezing singular advantage out of any circumstance, regardless of how dire the implications for our democracy. And when the Electronic Frontier Foundation (EFF) posted thousands of pages of documents “detailing behind-the-scenes negotiations between government agencies and Congress about providing immunity for telecoms involved in illegal government surveillance” last month, they lifted the lid on what should be a major scandal, not that corporate media paid the least attention. A lid that Obama’s “change” regime hopes to slam back down as expeditiously as possible. Hoping to forestall public suspicions of how things actually work in Washington, the administration has declared that “it will continue to block the release of additional documents, including communications within the Executive Branch and records reflecting the identities of telecoms involved in lobbying for immunity,” according to EFF’s Senior Staff Attorney Kurt Opsahl. No small matter, considering that should a court ever find avaricious telecoms and ISPs liable for violating the rights of their customers, fines could mount into the billions. Even in today’s climate of corporate bailouts and “too big to fail” cash gifts to executive suite fraudsters, damages, both in monetary terms and adverse publicity, would hardly be chump change. Without belaboring the point that corporate media largely failed to expose the extent of the dirty deals struck amongst these scofflaws, Soghoian, a graduate student no less, stepped into the breech and filled some necessary gaps in the surveillance story. All the government need do to obtain a pen register or trap and trace order, which examine to/from/subject lines of email messages, URLs of viewed web pages, search terms, telephone numbers dialed and the like, is to unilaterally declare that information obtained via this backdoor route is “relevant” to an ongoing criminal or counterterrorist investigation. In other words, give us everything we want and move along! The nation’s telecoms and ISPs have been very accommodating in this regard. And, as with other recent historical examples that come to mind such as the rush by U.S. firms to “rebuild” Iraq, Afghanistan and other benighted nations “liberated” by that “shining city upon a hill” that bombs, maims and generally does what it pleases because it can, servicing the secret state’s limitless appetite for “actionable intelligence” has proven to be a very lucrative cash cow indeed. A web portal I might add, equipped with a built-in price list ready-made for charging securocrats who spy on our blog posts, emails, web searches, mobile phone pings; indeed, any data the government might deem worthy of an “investigation.” Call it a PayPal for spooks; now how’s that for convenience! Closed to the media and the public, the enterprising researcher obtained entry as a graduate student and recorded several sessions, since taken down at the insistence of ISS’s corporate master TeleStrategies, who hosted the conference. Describing itself as “the leading producer of telecommunications conference events in the United States,” the firm claimed that Soghoian’s recordings “violated copyright law.” But not having deep pockets to weather a Digital Millennium Copyright Act (DMCA) takedown fight, he removed the files from his blog. Inquiring minds can’t help but wonder what was so threatening to the corporatist apple cart that they threatened to bring their thumb down, on a student no less? Let’s take a look! NICE Systems, another “leading provider” of what it calls “Insight from Interactions solutions” derived from the “the convergence of advanced analytics of unstructured multimedia content and transactional data–from telephony, web, email, radio, video and other data sources.” Partners in the “Security Sector” include, among others, Raytheon, Honeywell, Siemens, Lockheed Martin, HP, Tyco and Motorola, all of whom are heavy-hitters in the Military-Industrial-Intelligence Complex and niche players in the burgeoning electronic surveillance industry in their own right. Next up is SAP, a firm whose Government Support & Services division provide “a comprehensive range” of “enterprise software applications” to “help the analysts of the Intelligence Community” obtain “timely, accurate, objective and relevant intelligence.” One can only wonder whether Doug Feith’s shop over at the Pentagon deployed SAP “solutions” to find Saddam’s “weapons of mass destruction” during the run-up to the Iraq invasion! Taking their turn on the dais is Spectronic Systems, a Danish firm that is “100% privately owned.” Little however, could be gleaned from a perusal of their web site since the company kindly informs us that it “is strictly for the benefit of Government Agencies, Law Enforcement Agencies, Intelligence Agencies and Government Approved companies.” However, ISS World was good enough to disclose that Spectronic activities include “the development and manufacturing of monitoring systems and monitoring centres” for telephone, internet, fax and modem traffic. Their systems are designed to “handle–i.e. retrieve, collect, decode, store and present–bulk data,” that can double as “data retention systems” for “bulk monitoring of SMS, MMS, e-mails or other means of data communication.” But how beneficial is it to the bottom line? Alas, a diligent search of the business press by this writer hit a veritable blank wall. SS8 on the other hand is more forthcoming, claiming that their “products” allow intelligence agencies to “visualize and analyze a target’s internet session” and to “recognize, monitor, investigate and prevent criminal activity.” Proud that they have a “global reach,” SS8 broadcasts that their “electronic surveillance solutions” are “deployed in over 25 countries” and that their data installations “can intercept more than 100 million subscribers.” The firm’s platform for internet, WiFi, broadband and satellite interception claims to be capable of ferreting out “hidden relationships” while identifying “trends” (code for data mining and social network analysis) that “meet the functional needs” of the secret state. Amongst the exhibitors at ISS World, one finds (yet another) spooky Israeli firm Narus, whose hardware was a permanent “guest” in ATT/NSA “secret rooms” scattered around the country for surveillance of the entire Internet. First disclosed by ATT whistleblower Mark Klein in his sworn affidavit on behalf of EFF’s lawsuit, Hepting v. ATT, the firm’s STA 6400 traffic analyzer can monitor traffic equal to 39,000 DSL lines at 10 Gbit/s, or in practical terms, a single Narus machine can surveil several million broadband users at any given time. In 2004, the former Deputy Director of NSA, William Crowell joined the firm’s board of directors. As a result of FAA’s retroactive immunity provision, Hepting v. ATT was dismissed in 2009. Which brings us full-circle to Sprint Nextel’s spiffy new web portal that enables the secret state to “ping” their customers’ GPS locations eight million times in the space of a year. 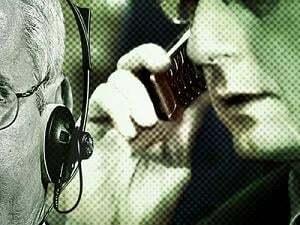 Hoping to learn more, Soghoian filed multiple Freedom of Information Act (FOIA) requests with the Department of Justice, seeking relevant details on just how much these corporate grifters charge our silent guardians for their electronic spying. It was at that point that Soghoian ran into a brick wall. When he uncovered evidence that the illicit surveillance compact amongst federal security agencies, telecoms and ISPs was a limitless gold mine enriching shareholders at the expense of our constitutional rights, the firms struck back. “Verizon and Yahoo intervened and filed an objection on grounds that, among other things, they would be ridiculed and publicly shamed were their surveillance price sheets made public,” Wired reported December 1. What do these firms have to hide? Apparently, quite a lot. Despite their whining, the indefatigable John Young, webmaster of the intelligence and security whistleblowing web site Cryptome, has published the Yahoo! Compliance Guide for Law Enforcement. The 17-page handy guide for spooks and cops provides information on what the firm can and will provide the secret state (everything) and what it will cost. Cryptome, never a site to run from a fight, has also posted the compliance guides of AT&T, Verizon, Sprint, Voicestream, Cox, Cingular, SBC, and Pacific Telesis. As Antifascist Calling has averred many times, since the business of America’s security is, after all, business, let’s just say the “service” Yahoo provides our nation’s spooks doesn’t come cheap. For his sterling efforts to inform the public, Young has been threatened by Yahoo attorneys with the tony Washington law firm Steptoe & Johnson. Young fired back December 2: “The Yahoo document hosted on Cryptome was found on the Internet at a publicly accessible site. The Compliance Guide reveals, for example, that Yahoo does not retain a copy of e-mails that an account holder sends unless that customer sets up the account to store those e-mails. Yahoo also cannot search for or produce deleted e-mails once they’ve been removed from a user’s trash file. The guide also reveals that the company retains the IP addresses from which a user logs in for just one year. But the company’s logs of IP addresses used to register new accounts for the first time go back to 1999. The contents of accounts on Flickr, which Yahoo also owns, are purged as soon as a user deactivates the account. Chats conducted through the company’s Web Messenger service may be saved on Yahoo’s server if one of the parties in the correspondence set up their account to archive chats. This pertains to the web-based version of the chat service, however. Yahoo does not have the content of chats for consumers who use the downloadable Web Messenger client on their computer. Do the math for millions of customers whose rights have been abused and violated and pretty soon we’re talking serious money! Well guess what, guilty as charged! Now that the information has been widely posted and mirrored by the global whistleblowers Wikileaks and countless other web sites, we should consider the alarming implications of Christopher Soghoian’s essential research to our privacy and democratic rights and act accordingly. Barring a mechanism that guarantees public accountability from the secret state and their grifting corporate partners, we are left with no alternative but to name and shame. After all, democracy is not a spectator sport!